Payday Loans, Title Loans and Cash Advance Centers – Apply Online or In-Store. Tomorrow Can Be Payday! Check Into Cash makes it fast and easy for you to get the cash you need now. Payday Loans Online: Simply complete five-minute online application, and one of representatives will call to take you through our confidential and secure process. Get approved today and get your cash fast! Cash Advances: Stop in any of our more than 1,000 Check Into Cash centers near you! Just bring a check, along with your photo ID and other required documents, and complete application. Title Loans: Most of stores now also offer title loans. A title loan is an easy way to borrow against the value of your car. Just bring in the clear title, the vehicle, and a photo ID to get the cash you need fast. Want to get started? As a direct lender, Check Into Cash does not sell your information to any third parties or involve any extra steps with the lending process. The Annual Percentage Rate (APR) for payday loans varies in each state and depends on the advance amount, fees, and terms of the transaction. The APR for a $100 single-payment payday loan may range from 260.71% to 782.14% on 14 day terms. Read the Check Into Cash Payday Loans terms and conditions. Is Check Into Cash Available In Your State? Check Into Cash is available in the following states: Alabama, Alaska, California, Delaware, Florida, Hawaii, Idaho, Illinois, Indiana, Kansas, Louisiana, Mississippi, Missouri, Nevada, Ohio, Oklahoma, Oregon, Tennessee, Texas, Utah, Washington, Wisconsin, Wyoming. What will you need to get started on your online loan application? Additional documentation Lending requirements vary by state. Some states require additional documentation, such as a bank statement, pay stub, social security card or state issued photo identification. BBB has determined that Check Into Cash, Inc. meets BBB accreditation standards, which include a commitment to make a good faith effort to resolve any consumer complaints. BBB Accredited Businesses pay a fee for accreditation review/monitoring and for support of BBB services to the public. BBB records show a license number of 007788 for this business, issued by Secretary of State/TN. The expiration date of this license is 4/1/2018 12:00:00 AM. BBB records show a license number of 2121 for this business, issued by Department of Financial Institutions. The expiration date of this license is 3/31/2018 12:00:00 AM. Check Into Cash has received 5 out of 5 stars based on 0 Customer Reviews and a BBB Rating of A+. Check Into Cash is a financial services retailer with more than 1,100 stores in 30 states. The company was founded in 1993 by W. Allan Jones in Cleveland, Tennessee, where the headquarters are located today. 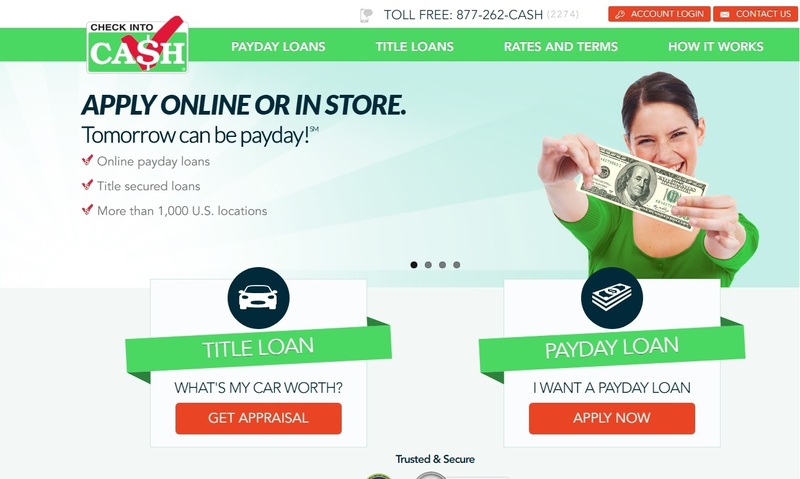 The firm offers payday loans, online payday advances, title loans, bill payment services, check cashing, reloadable prepaid debit cards, and Western Union money transfers and money order services. In 2012, The firm acquired Cash and Cheque Express, a consumer financial services chain in the United Kingdom. In 2013, the firm acquired Great American Pawn and Title and Quic!oans, both based in Georgia, plus Great American Cash Advance and Nations Quick Cash Title Pawn, which operate in Mississippi, Alabama, and Tennessee. Check Into Cash has also acquired Title First Title Pawn, which is based in Georgia.